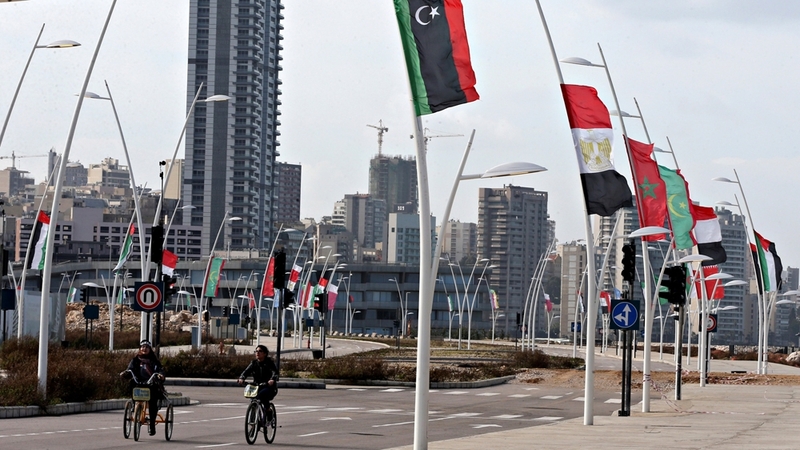 Beirut, Lebanon – Poor attendance of regional leaders and divisions over Syria overshadow the Arab Economic and Social Development Summit which begins on Sunday in Lebanon’s capital, Beirut. After initially pulling out, Qatar‘s emir is expected to attend the official session of the summit. Lebanon‘s presidency confirmed on Saturday that Sheikh Tamim bin Hamad Al Thani will arrive in the Mediterranean city before the meeting. At Beirut’s Rafic Hariri Airport on Saturday, Lebanese President Michel Aoun received Mauritanian President Mohamed Ould Abdel Aziz, the only other head of state expected to attend the summit. Instead, 20 countries taking part in the summit sent delegations that arrived in Beirut throughout Friday and Saturday, including Egypt’s Foreign Minister Sameh Shoukry and the Palestinian Prime Minister Rami Hamdallah. Elias Sakr, Lebanese journalist and analyst, called the summit a “complete failure”. “It shows that Lebanon, given its political divisions, has failed to get the Arab states to agree on a strategy that would help it face its economic and political challenges,” Sakr told Al Jazeera. Although it has a lower profile than the Arab League summit, the lack of attendance portrays Lebanon’s weak regional diplomacy, and domestic and regional rifts over Syria and its ally Iran, other analysts said. “The lack of attendance gives a message that Lebanon lacks agency,” said Mohanad Hage Ali, a political analyst at Carnegie Middle East Center. “The attendance of Arab leaders would have supported Lebanon, a failing state economically and politically, and would have helped it relaunch itself on the Arab stage after being seen as an Iranian pawn for years,” Ali told Al Jazeera. While Lebanese Foreign Minister Gebran Bassil called for Syria’s return to the Arab League during a pre-summit meeting on Friday, referring to Syria’s absence as the “the biggest gap in the conference”, the group’s Secretary-General Ahamed Aboul Gheit told journalists at a press conference later in the day that there was no agreement over Syria’s return. Syria’s membership in the League was suspended in 2011, but political forces inside Lebanon remain divided over the issue, reflecting a wider rift among neighbouring countries over the prospect of normalising ties with Damascus. “The divide is domestic and regional. Hezbollah and Amal [backed by Iran] want to bring Syria back into the league, while other groups do not,” said Yousef Diab, a Lebanese political analyst. Lebanon’s Iran-backed Hezbollah has fought alongside Assad, and its political allies including President Michel Aoun have recently stepped up calls for rapprochement with Damascus. “Likewise, while some Arab countries such as Iraq and Algeria may support the move, Arab leaders’ boycott of the summit signals some sort of blame towards Lebanon for wanting Syria at the summit,” Diab told Al Jazeera. “The list [of attendees] was acceptable for an economic summit, but after the incident, many pulled out in a show of solidarity with Libya,” Ali told Al Jazeera. The incident has also reflected negatively on Lebanon’s security situation. “What happened with the Libyan flag, and the lack of response from the state to hold the perpetrators accountable, has shown that on a security level, Lebanon is not fit to host this summit,” said Diab. Previous articleDid Paul George Make the Right Call Choosing OKC, Westbrook over LeBron James?